For the past two centuries Poland been a key catalyst for political change in Central and Eastern Europe. Even when occupied in the 19th century by neighbouring powers Prussia, Russia and Austria under the partitions, Poland was an inspirational beacon of patriotic insurrection. Its brief sovereign independence between the two World Wars was ended by yet another forced partition, the German-Soviet Pact in 1939. After Soviet troops liberated Poland from Nazi oppression in 1944, there followed 45 years of Soviet dominance, exercised through puppet local communist governments. But in 1989, a national unified Solidarity democracy movement took peaceful control of Poland from an exhausted communist regime. Having gained its unified objective of national liberation from communist rule, Solidarity quickly broke up, and its elements re-formed themselves into an array of parties representing various political-social orientations and interests. There has followed 18 years of rather volatile parliamentary democracy, as one unstable coalition has succeeded another. The key fault-line in Poland has become clear in these years, and it is not a conventional Left–Right faultline. Rather, as in 19th century Russia, the real argument is between 'westernisers' and 'Polonophiles' — the former, people who yearn for liberal Western European style market democracy, and a secular state with the normal Western European rights for women and minorities; and the latter, people with a romantic or sentimental vision of Poland's special destiny as a powerful, populous, strongly anti-Russian, socially conservative Catholic country at the heart of Europe. Poland's socialists and social democrats have sat uneasily between these polarities, sometimes siding with conservative Catholic welfarism's interest in protecting workers, but sometimes supporting a free market liberal society. Since Lech Walesa, no charismatic party or leader has emerged to represent this 'Third Way'. Some of the original Solidarity leaders are still around, but they are ageing and exhausted. Worryingly for liberals, in the last few years in Poland, as in other former Communist countries such as Hungary, romantic nationalists have been in the ascendant. Over the past two years, Jaroslaw Kaczynski has been Poland's prime minister; while bizarrely, his identical twin Lech Kaczynski has been president (a position that has considerable prestige and reserve powers). Their Law and Justice Party headed a ruling conservative-nationalist coalition government, which included some rather dubious elements at the fringes. Now Jaroslaw has been decisively defeated as prime minister, by a coalition headed by 50-year-old Donald Tusk (pronounced 'Toosk'), who leads the Civic Platform Party, a firmly free-market liberal party. Tusk's victory ends a period when Poland was becoming something of a laughing stock in EU circles for its aggressively conservative policies on issues including gay unions and abortion, and for its unquestioning loyalty to Bush Administration policies in respect both of the Iraq War and a US-proposed NATO European missile shield, much of which would be installed in Poland. The Kaczynskis were also reopening old social wounds in Poland by their aggressive policies of exposing and shaming former communists who had made their peace with Solidarity and had generally been rehabilitated into national public and economic life. The Kaczynskis were determined to remove such people, to make way for a newly purged national elite. Tusk's policies on these matters represent a decisive turning away. Tusk promises to soon bring home 900 Polish troops still serving in Iraq. He is not interested in ideological witchhunts against former communist officials. He is fervently pro-EU, and a man of liberal European spirit. He represents younger, more sophisticated urban Poles — against the Kaczynskis who speak to older, conservative rural and smalltown voters and the more conservative elements of the Polish Church. Under Tusk, Poland rejoins the European Union mainstream, and will again be able to resume its role as the catalyst of change in former communist Europe. Poland, the most populous (and arguably, most advanced) of the former Soviet satellite states (only the Ukraine is larger) will once again be able to play the role envisaged by leading Solidarity activists in 1989 — as a pacesetter of liberty and modernity in Central and Eastern Europe. Back in the early 1990s when I knew him as a young politician — in his early 30s — Tusk seemed so Westernised that his chances of ever becoming Polish prime minister were nearly non-existent. His party was always a minority voice in various coalitions. 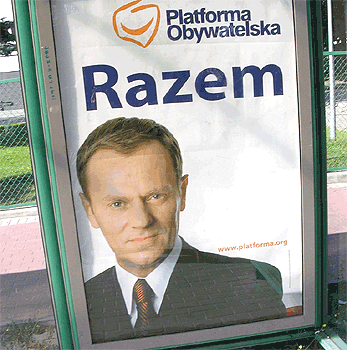 Now, thanks to the rejection by Polish voters of the conservative extremism of the Kaczyskis, Tusk's chance has come. The next few years will be challenging for Tusk and for Poland. There is still much poverty and high unemployment — many decaying communist-era factories have yet to be fully modernised or replaced. Many educated young Poles must still go west, to richer EU states, for decent wage opportunities . For these people — and the young Poles in cities, who voted strongly for his party — Tusk represents modernisation and hope for the future. Tony Kevin retired from the Australian Department of Foreign Affairs and Trade in 1998, after a 30-year public service career in DFAT and Prime Minister's Department. He was Australia's ambassador to Poland (1991–94) and Cambodia (1994–97). Cardinal Pell does not underscore his climate change denial with theological justification, as he does with his position on issues such as human cloning. It is unfair to him, and to the Catholic Church, to assume that his personal views on climate change represent Church teaching.